Pitfall! is a platform game released in the early 1980s for a variety of consoles and computers, featuring a rope- swinging, alligator-hopping jungle explorer on a mission to collect treasure. It was huge at the time, with a legacy that lasts to this day. Here are ten facts about Pitfall! Pitfall! was originally released for the Atari VCS/2600 console by Activision and was ported to many other computer and consoles including the Atari 5200, ColecoVision, Commodore 64, Intellivision. Sequels to and remakes of the game have appeared on many major computers and consoles available since. Over 4 million copies of Pitfall! were sold for the Atari VCS/2600. This makes it the second most successful game for the console. The most successful was Pac-Man which sold 7 million. The name of the main character in Pitfall! is Harry. 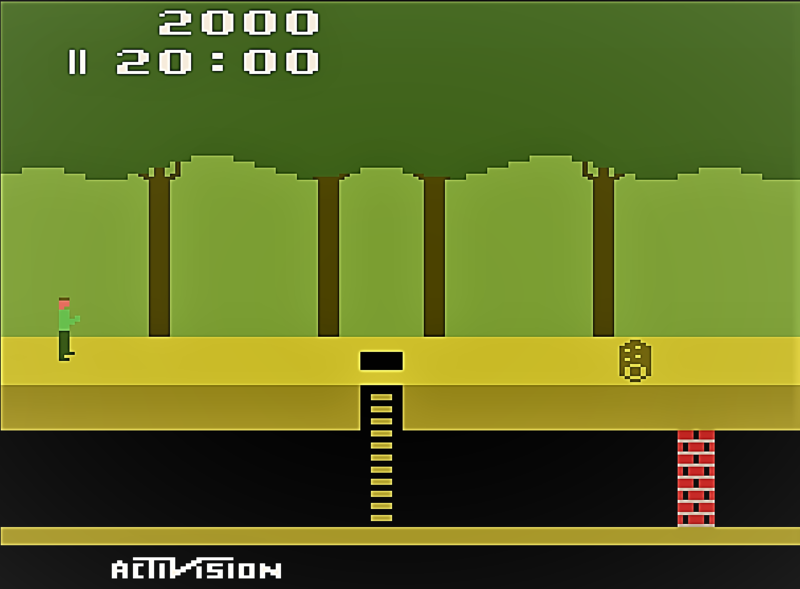 The sequel to Pitfall!, Pitfall II: The Lost Caverns (1983), is included in the video game Call of Duty: Black Ops II (2012). It is unlockable in the Nuketown 2025 downloadable map, along with three other Activision games released for the Atari VCS/2600. This isn’t the only time a Pitfall game has been hidden within another game. Pitfall: The Mayan Adventure (1994), which was released for the Super Nintendo, Sega Mega Drive/Genesis, Windows and Gameboy Advance, featured the original Pitfall! game in a hidden part of the fourth level. The creator of Pitfall!, David Crane, states that it took him ten minutes to come up with the idea for the game after trying to figure out what to do with an animated running man, and 1000 hours to program it. Players scoring over 20,000 points on Pitfall! were able to receive a prize from Activision, the game's publisher, by sending in a photograph of themselves and their television screen. Fortunately, this was in the days before Photoshop. The prize was an Activision Explorers' Club badge featuring Pitfall Harry. The aim of Pitfall! is to collect 32 treasures within the game’s 20 minute time limit. Not as easy as it sounds as there are 250 screens to explore in the game. Jack Black, 13 years old at the time, made his acting debut in a TV commercial for Pitfall! Here it is!